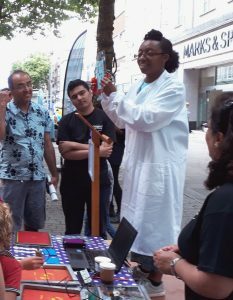 Soapbox Science are looking for women researchers, from PhD students to professors, from entry-level researchers to entrepreneurs, to inspire the public with their work and enthuse others about their area of science, technology, engineering or maths (STEM). You’ll have the opportunity to engage with a wide cross-section of the public including those who haven’t had the chance or means to meet a scientist or the opportunity to find out what science happens in their area. It could boost your profile through participation in an international movement, an invitation to write a blog along with potential local and national media coverage. This year there are over 40 events in 14 countries. Soapbox Science uses an inclusive definition of “woman” and “female” and they welcome applications from trans women, genderqueer women, and non-binary people who for the purpose of this event feel comfortable being female-identified. Interested but nervous? Read an organiser sharing her thoughts on the most common worries. Deadline – Friday 1 March, 2019.